CJ 4DPLEX (cj4dx.com), the world's leading cinema technology company, announced that 20th Century Fox's new futuristic action film "Alita: Battle Angel" is coming to theaters in ScreenX on February 14, 2019. "Alita: Battle Angel" will be the third movie from 20th Century Fox to be converted into ScreenX. The collaboration follows the recent global success of "Bohemian Rhapsody" and "Kingsman: The Golden Circle." ScreenX is the world's first multi-projection theatre technology that allows a 270-degree panoramic movie watching experience. ScreenX allows the audience to go beyond the frame of the traditional movie screen, utilizing a proprietary system to expand the center screen image to the side walls, surrounding audiences with imagery and providing a sense of being inside the movie. "'Alita: Battle Angel' is an epic action/adventure from visionary filmmakers James Cameron and Robert Rodriguez that takes glorious visual effects to a new level and pushes the envelope of ScreenX's full potential," JongRyul Kim, CEO of CJ 4DPLEX, said. "We are thrilled to partner with 20th Century Fox to bring this breathtaking heroine's journey to audiences in our newest cinematic experience." Andrew Cripps, President of International Theatrical Distribution, 20th Century Fox, said, "We're excited to be partnering again with CJ 4DPLEX on the release of 'Alita: Battle Angel'. Filmmakers James Cameron and Robert Rodriguez both have a long reputation of pushing the envelope of cinematic storytelling, creating immersive worlds with groundbreaking visuals that leave audiences in awe. This is the perfect film to experience the full immersion of ScreenX technology." ScreenX has quickly enhanced its international reach, successfully screening Hollywood blockbusters and local feature films alike, including a record of eight Hollywood blockbusters released in ScreenX this year. In the past 12 months alone, ScreenX has seen a surge in the number of ScreenX installed auditoriums, which have grown to 191, a more than 30% increase year-over-year and will nearly double its footprint with the recently announced expansion plan with the Cineworld Group to open 100 locations across the U.S. and Europe. From visionary filmmakers James Cameron (AVATAR) and Robert Rodriguez (SIN CITY), comes ALITA: BATTLE ANGEL, an epic adventure of hope and empowerment. 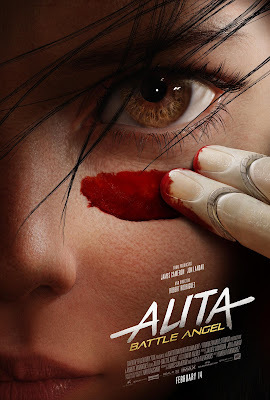 When Alita (Rosa Salazar) awakens with no memory of who she is in a world she does not recognize, she is taken in by Ido (Christoph Waltz), a compassionate doctor who realizes that somewhere in this abandoned cyborg shell is the heart and soul of a young woman with an extraordinary past. As Alita learns to navigate through the treacherous streets of Iron City, Ido tries to shield her from her mysterious history while her street-smart new friend Hugo (Keean Johnson) offers to help trigger her memories. When the deadly and corrupt forces of Iron City come after Alita, she discovers a clue to her past – she has unique fighting abilities that those in power will stop at nothing to control. If she can stay out of their grasp, she could be the key to saving her friends, family, and the world she's grown to love. 4DX provides moviegoers with an immersive, multi-sensory experience, allowing the audience to connect with movies through motion, vibration, water, wind, snow, lightning, scents, and other special effects that enhance the visuals on-screen. Each 4DX auditorium incorporates motion-based seating synchronized with more than 20 different effects and optimized by a team of skilled editors, maximizing the feeling of immersion within the movie, beyond the limits of audio and video. More than 570 Hollywood and local titles have been screened in 4DX. To date, more than 70,000 4DX seats operate in 600 auditoriums, spanning 61 countries. ScreenX is the world's first multi-projection theater technology used within a theatre setting, marking it as the most visually immersive theater experience of CJ 4DPLEX. ScreenX allows moviegoers to go beyond the frame of the movie screen by utilizing a proprietary system that expands images of feature films and pre-show advertising to the left and right walls of the theatre, creating an immersive, panoramic, 270-degree viewing experience. To date, ScreenX has been installed in 191 screens around the world, including 86 screens in South Korea; 63 screens in China; 11 in the United States; 8 in England; 4 in Turkey; 4 in Japan; 3 in Switzerland; 2 in France; 2 in Vietnam and 1 in Canada, Spain, Hungary, UAE, Kuwait, Thailand, Indonesia, and Israel.